Why Choose the SENTIENT ELEMENT ? 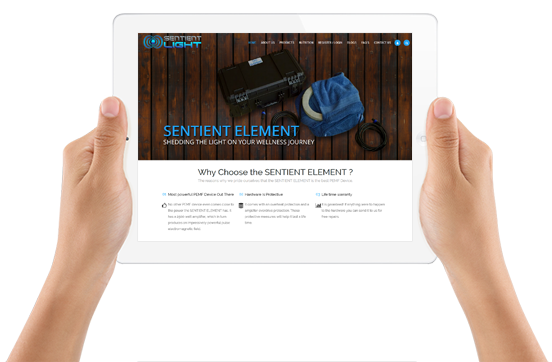 The reasons why we pride ourselves that the SENTIENT ELEMENT is the best PEMF Device. No other PEMF device even comes close to the power the SENTIENT ELEMENT has. It has a 2500 watt amplifier, which in turn produces an impressively powerful pulse electromagnetic field. It comes with an overheat protection and a amplifier overdrive protection. These protective measures will help it last a life time. It is guaranteed! If anything were to happen to the hardware you can send it to us for free repairs. We have charts that compare prices with most popular PEMF device on the market today. It is $3,500 and is by far the cheapest one out there. We not only have the most powerful PEMF device but also offer a dual coil system. This can give you a greater surface area of pulse electromagnetic field. It has an amazing frequency range of 7 - 10,000Hz. Most PEMF devices only range from 1-50Hz. These higher frequencies are important because they debilitate the pathogens. SENTIENT ELEMENT has now a carry-on case with a pull handle with wheels and is lighter in weight, so it is now easier to travel with. You will now know what the input energy (or power) is being delivered to the coiling as you flip through different frequencies and intensities. Before it was just guessing. It is now designed so the user will know what is exactly happening at the coil itself. No foil tests and no separate magnetic field detector needed. The coolest feature is that you will now know what frequency is being delivered at the coils itself with a cutting-edge frequency meter. So, if you happen to use third party software (like the one where you speak into a microphone to get a diagnosis where it can change from hour to hour), there will be no more wondering what is in the “secret sauce” or where you just find yourself guessing...! It is equipped to have two-coils (Yes you can hook up two coils now and it doesn't divide the power) It is equivalent to having a bio-mat. YES, two coils with real power. Larry Langdon, Founder of SENTIENT ELEMENT was bit by a tick while hiking in the Cascade foothills just East of Seattle. Over time,Larry had gone through the typical progression of Lyme and put on an antibiotic regimen and did see some improvement but soon after lost ground and got worse as the spirochetes became antibiotic resistant. At this point Larry was desperately searching for a cure of which maybe did not exist. However, he found that non-conventional energy medicine along with special diets had the most success because the body wants to heal itself. This is when he discovered non-invasive “Pulsed Electro Magnetic Field” (PEMF) therapy where the lower sound range frequencies could debilitate many of these zoonotic (animal to human) pathogens. PEMF therapy can induce sleep in insomnia and other sleep related disorders.PEMF therapy can improve sleep by stimulating hypothalamus, which controls circadian and sleep rhythms. 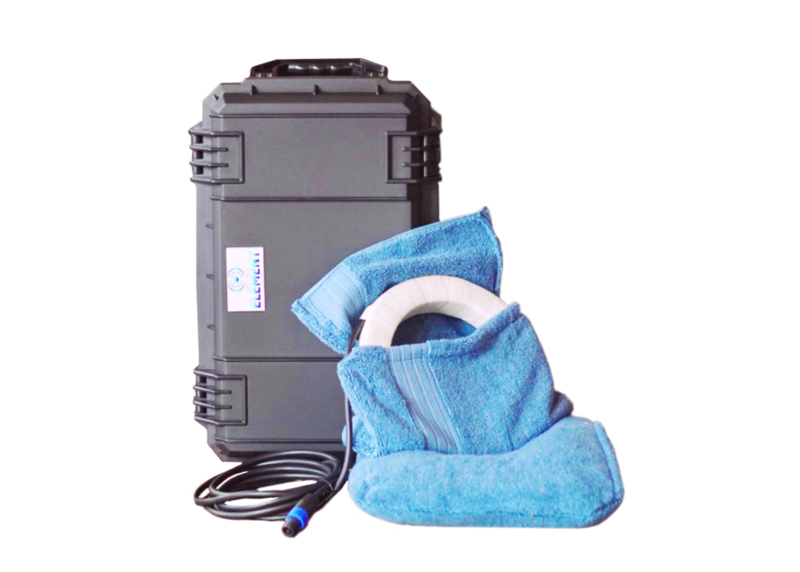 PEMF therapy has been successful in reducing inflammation by recharging the cells with a mild electromagnetic current which help the cells heal faster with less swelling, pain and bruising. PEMF therapy helps people with arthritis and rheumatism in improving their range of motion and get them back on their feet again. PEMF has been known to reduce acute and chronic pain without side effects. PEMF produces natural endorphins in the central nervous system that block the transmission of pain signals to the brain. PEMF is useful for those with Parkinson's, Alzheimers where motor coordination begins to decline.Athletes experience performance enhancing effects. How does payment and delivery work? We build all units "to order", meaning we don't stock any finished goods (this is one of the ways we can keep the price down). We close the orders every Saturday at 12pm, then we build however many machines were sold that week. It takes a little under 7-10 business days to build and sent out to the costumer. When you place your order, we invoice you for $1250.00 down. The balance plus shipping is invoiced when the units are ready to ship. We invoice through PayPal, but you don't have to have a PayPal account to pay the invoice (you can pay the invoice directly with a credit card). Does the SENTIENT ELEMENT have the same capabilities as the AmpCoil? Assuming you are referring to the claim AmpCoil makes about their "BetterGuide" software diagnosing disease and automatically setting up the proper frequencies to run, simply put, their BetterGuide is a scam and doesn't do what is claimed. Now, you expect us to say that, but let's apply a little logic and common sense to the issue. If they could truly diagnose disease, why are they not making millions just selling the software to the medical industry? For that matter, if they could truly diagnose disease, why have they not won a Nobel prize in medicine? After all, this is something that scientists at MIT have been working on but have been unable to do. Additionally, when the BetterGuide runs, it doesn't tell you what frequencies it is using. Why not? Is it because that would allow people to check it against lists of known frequencies for pathogens? There is another way we can question the validity of their claims for their software. That is to look at other claims they make, such as their coil is a "modified Tesla coil". This is a marketing buzz word. Tesla coils use extremely high voltages and frequencies, and are extremely dangerous to be near. A little research on the internet will show you this. PEMF coils do not use those dangerous levels. It may make their coil sound special, but it is not anything like a Tesla coil just because they are both coils. There are all kinds of coils being used in technology...in speakers, relays, microphones, computers, etc. just to name a few. None of these are anything like a Tesla coil other than they are a coil. If they are not willing to be honest about such a simple thing as a coil, can you trust their BetterGuide to be any more honest? The SENTIENT ELEMENT actually gives you more capabilities. The chassis is improved compared to the AmpCoil with additional protection circuits. Our coil has been redesigned (based on what we have learned over the years) to produce a better range of optimal frequencies, theirs has not. They don't let you have any control or knowledge of the frequencies being used, while our system gives you total control. Additionally, there are differences beyond the capabilities. They make you pay to duplicate what you already own (the tablet). We save you money by not making you do this since any tablet, smart phone, or laptop can be used to create the frequencies to be input into the SENTIENT ELEMENT. They add on thousands of dollars for their software (that doesn't work), while we recommend using Frex16 that is less than $100.00 and gives you total control. Our machine is lighter and small enough to be set up all the time without being in middle of the floor. And of course, there is the price. They are all about making as much money as possible, while our mission statement is to make the system as inexpensive as possible so more people can benefit from the use of PEMF. Their advertising cost is huge and must be paid for with a higher price. We use only free methods to let people know about us so we don't have to increase the price. How does the remote frequency device work? 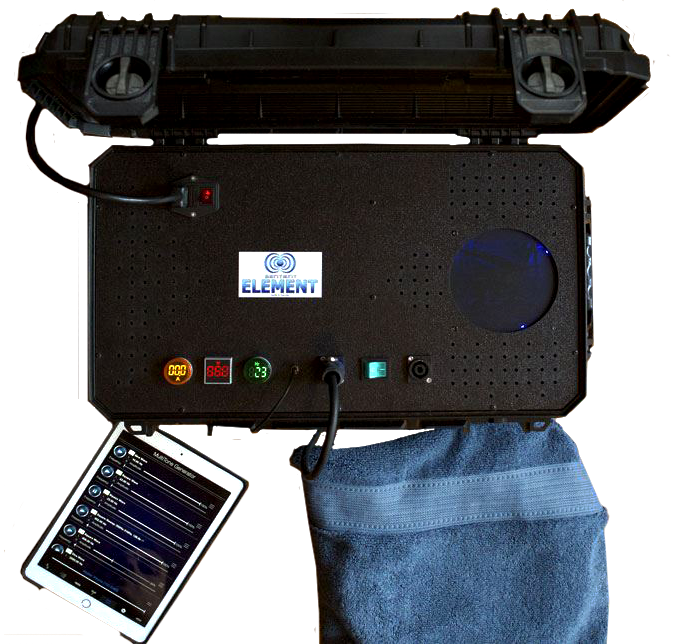 The SENTIENT ELEMENT serves as a very powerful, laboratory-grade amplifier for the input of a remote frequency generator. This is really just a technical way of saying that The SENTIENT ELEMENT is fed by an external device, such as a tablet, laptop, or smart phone with a program or app downloaded to generate the frequencies. Or, you can simply play a frequency directly from the internet via your laptop, tablet or smart phone. Sites like YouTube have hundreds of frequencies to choose from that people have created for the benefit of everyone. Choosing a remote device. It all comes down to what app or program you want to run, for example programs that feature Resonance Initiated Field Effects (R.I.F.E.1 ). As far as we know, the only program that has R.I.F.E. frequencies preprogrammed in is FreX16 ( http://www.frex.com.au/ ). It only runs on a Windows® platform, so you would want to use a laptop. If that is the only thing you will be using the laptop for, the smallest, cheapest unit you can find will be plenty capable of running the SENTIENT ELEMENT, so long the laptop has an audio out jack. Visit www.frex.com.au/ to download the program at no cost to have a look at it. Frequencies will run for 6 minutes, then requires you to click away the registration invitation to continue the program. Registration (requiring purchase) removes these signal interruptions. A valuable related site is Welcome to FreX — Help & Tips ( https://www.scribd.com/document/268339185/Welcome-to-FreX ). This site includes an extensive database of FreX frequency sets that can be accessed from within FreX. The downside of the FreX162 program is that, although relatively inexpensive, it is not free like some apps, and it does not allow you to run multiple frequencies at once (it does allow different frequencies programmed to run one after the other as a single setup, just not different frequencies at the same time). How do I know what frequencies to use? PEMF frequencies break down into two basic groups, below 100Hz and above 100Hz. Frequencies below 100Hz are referred to a "cell signaling" frequencies and will help with disease that originates from within the body (breakdown of normal body functions). They tell your cells to do things they would otherwise be doing naturally if your body systems were working optimally but for one reason or another are not. This could be caused by many things such as compromised immune system, lack of proper diet, injury (such as a broken bone), environment, and so on. Frequencies in this range can aid in improved blood circulation, better digestion, relieving inflammation, reducing pain, and the healing of body systems that are not damaged beyond healing. For example, the FDA has approved the use of PEMF for bone healing. The frequency used for this is 76.6Hz. Although there are many cell signaling or healing frequencies above 100Hz, the most basic and general wellness ones are in the 100Hz and below range. In the frequencies above 100Hz you find the "resident frequencies" of pathogens. If you have disease that originated from outside the body (bacteria, viruses, or generally all pathogens), the only way PEMF will affect them is to use the frequency that matches their resident frequency. It causes them to vibrate to the point of destruction. The resident frequency of virtually all pathogens is well above 100Hz.